Admission Committee for Professional Medical Educational Courses, B. J. 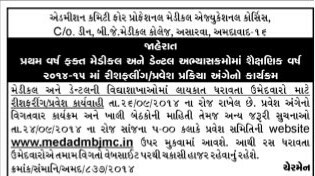 Medical College, Ahmedabad issued notification for First Year Medical and Dental Admission 2014-15 on at official website www.medadmbjmc.in. Qualified candidates First Year Medical and Dental Couse Admission process is held on 26.09.2014. A detailed program and the empty seats information available on website after 24.09.2014 at 6.00 p.m. Only qualified candidates for medical and dental faculty will take part in the program. During the evening all the admission information process to be put on the website. So candidates are advised to keep checking www.medadmbjmc.in Website everyday.